Trouble viewing email? Open as Webpage. This Sunday - Spiritual practices that help us connect with God and with each other. 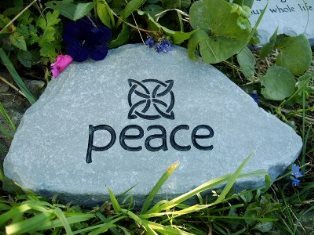 April 7 Connecting with God through Contemplative Prayer (Judith Lyons). 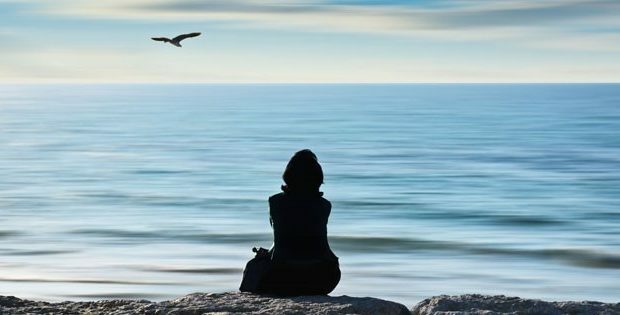 Sitting in silence is one of the ways we can connect to God, and we do that by quieting the mind and the body. In this class we will learn about the Christian practices in contemplative prayer, and we will practice together a short meditation. 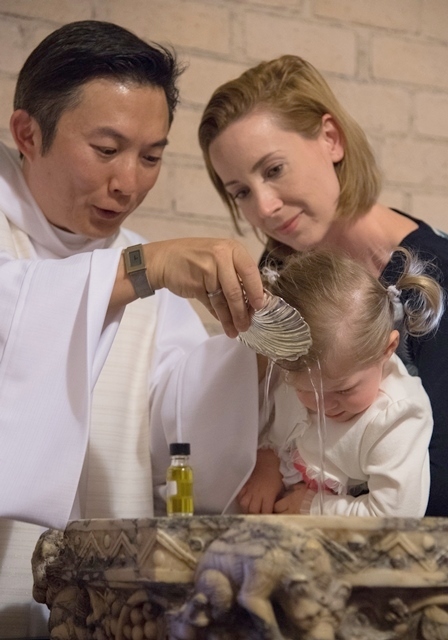 Are you or a family member wanting the Sacrament of Baptism? On April 20, the Easter Vigil , the night before Easter Sunday, is our next offering to celebrate someone becoming a new member of our faith tradition. (After that date, Pentecost, June 9, is the next of four offerings in the church year. We also perform baptisms for pastoral exceptions when another time is best for a family.) Contact Paula+ with questions. As a beginning to Holy Week, deepen your faith journey by joining Rev. Laurel and Canon Hank in the annual “Called to the Wall” pilgrimage, organized by the Diocese of Los Angeles and San Diego. Stations of the Cross are read along the way. All youth and adults invited. Meet at St. Francis at 6:30 a.m. (lower lot), then caravan to the next stops, which include St. Luke’s Long Beach, where we will meet youth and adults from St. Cross, then St. Michael’s Episcopal Church in Anaheim, and St. John’s Episcopal Church in Chula Vista 11:30 a.m. where lunch will be served. The final stop begins at the border parking lot at about 1 p.m.. Pilgrims will walk across the beach about a mile to the U.S.-Mexico border fence. 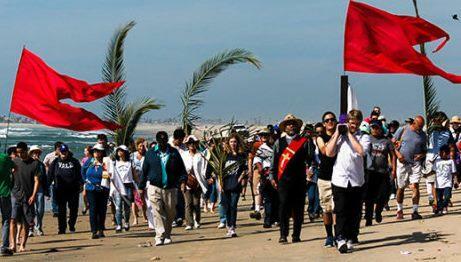 At each location Stations of the Cross will be read, including several during the beach walk. At the border the group will celebrate the Eucharist on the San Diego side of the wall as representatives of the Anglican Church in Mexico celebrate on the Tijuana side. After the Eucharist, pilgrims will walk back along the beach to the parking lot. If you’d like to join us, please see Laurel+ or Hank to confirm, and if you have any questions, please let us know. Laurel+ has visited the wall and is happy to share her experience with you. Palm Sunday - April 14, 10a.m. ONE service only. Stations of the Cross, 12:00 p.m., Church. The Great Vigil of Easter, April 20, 7:30 p.m.
Thursday, April 11, doors open at 6:30 p.m., program begins promptly at 7:00 p.m.
Interactive program and dinner - $25 per participant. 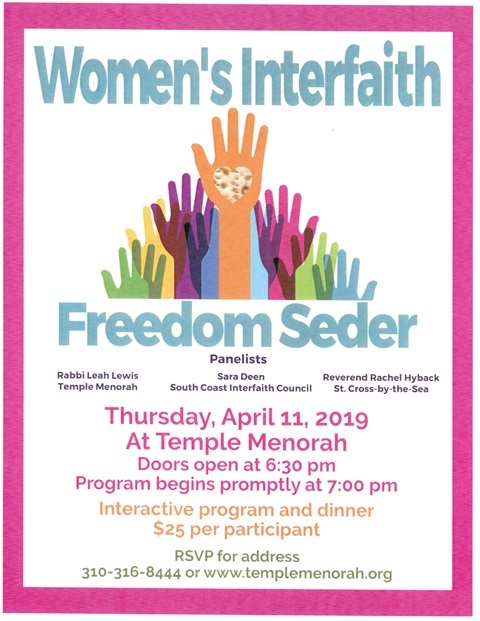 Wednesday, April 24, 5:00 - 6:30 p.m. At The Corner Bakery, 1868 S. Pacific Coast Hwy, Redondo Beach. Rev. 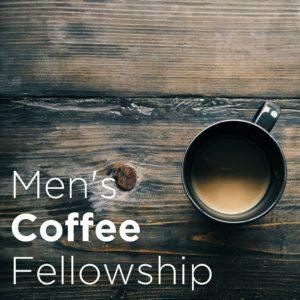 Peter Huang and Canon Hank Gatlin host this monthly fellowship time for men. Come join in each other's spiritual journey over a meal or cup of coffee. Let us know if you can join us—or just stop by! Disaster Preparedness Workshop, Sunday May 5th, Board Room, after each service. We are committed to having our parish family prepared in the event of an emergency. Please attend this workshop to review Basic Life Support, use of our AEDs, take a short tour of other emergency equipment available on campus, and review the Run, Hide, Fight Criteria in the event of an active shooter event. If you would like to help please contact Sue Ferme or Diane Diekman.We look forward to seeing you at one of the workshops and will be available to answer any of your questions. Meditation Group - Thursday Mornings, 9:30-10:30 a.m. in the Nason Prayer Chapel. No charge. Yoga - Monday & Wednesday mornings 9:00 - 10:30 a.m. Free-will offering. Contact Jill Fenske for more info, or to be added to her email contact list. Questions? Email Elaine Mistele . Or call her at the church office at 310 375 4617.